Osteoarthritis of the Knee is a very common ailment and is becoming more common as our population ages. Osteoarthritis (OA) is also known as arthrosis or degenerative joint disease. Although there are many types of arthritis, is it usually osteoarthritis that people think of when they hear the more general term. Here we provide a brief introduction to OA of the knee. The word arthritis means inflammation (swelling) of a joint. Osteoarthritis, also known as “wear and tear” arthritis is the most common type of arthritis. It is estimated that osteoarthritis affects one out of every ten Canadians and that 85% of Canadians over the age of 70 will have osteoarthritis. The knee is one of the most common joints affected by this disease. Osteoarthritis affects the articular cartilage in the knee. Articular cartilage is the smooth coating that covers the surface of the bones inside the knee. Articular cartilage also cushions and helps lubricate the joint surfaces (see the anatomy section for further information about articular cartilage). In osteoarthritis the articular cartilage begins to degrade. Over time the articular cartilage can thin or form cracks. Pieces of cartilage may come loose and float inside the knee, further irritating the joint After a long period of time the cartilage can become completely “worn away” and the bones begin to rub together. Osteoarthritis usually comes on slowly and results in knee pain, stiffness and/or swelling. Sometimes a grating sound can be heard when the knee is bent – such as when climbing up and down stairs or crouching. Bumps or nodes may appear around the knee joint. Sometimes a knee can have a mild amount of osteoarthritis and feel perfectly fine. Most types of treatment for osteoarthritis of the knee work best when started early, before there is a lot of “wear and tear” in the knee. For this reason establishing a correct diagnosis is very important. In some cases osteoarthritis of the knee can be diagnosed based on the medical history and physical examination of the affected joint(s). An x-ray may be ordered to determine how much joint damage there is. Sometimes blood tests or joint fluid tests are ordered to confirm the diagnosis or to distinguish between different types of arthritis. Previous knee injury i.e. meniscal tear, ligament injury. 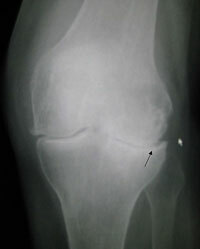 Damage to the knee from another type of arthritis. A lot can be done to help people who have osteoarthritis in their knee(s). The goal of treatment is to reduce pain, control swelling and maintain or improve mobility of the knee but unfortunately there is no known cure for osteoarthritis. Every osteoarthritic knee is different, and there should be a team approach to treatment. Some available treatments include exercises, medications, education on activity modification, weight loss, heat and cold therapy, techniques for joint protection, injections and in some cases surgery. Doctors and physical therapists who deal with people who have osteoarthritis can help outline a treatment program. 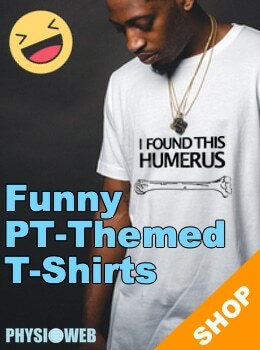 This content is provided courtesy of Knee Pain Info .com .